Right now, Agneta Bladh is on stage in the Humanities Theatre here in Uppsala. 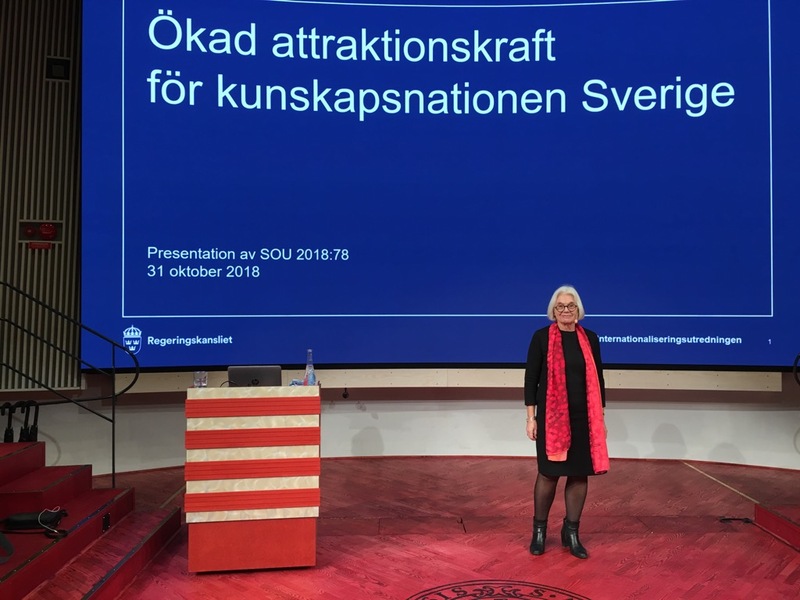 She is presenting the report of the Internationalisation Inquiry, “Making Sweden more attractive as a knowledge nation”, and the measures proposed in it. This is the first presentation of the final report of this government inquiry and we are pleased it is happening on our home turf. (Here’s a video of the presentation in Swedish). Internationalisation is nothing new for us in Uppsala. A university is international by nature and as Sweden’s oldest university, we have more experience than anyone else in this country of cooperation across national borders. Experience breeds perspective. We can see that internationalisation is evolving and becoming more complex. Research crosses borders in more than one sense of the word, and education is becoming increasingly global. As a result, universities around the world are seeking to make themselves more attractive. The time is long gone when internationalisation could be seen as an isolated activity. These days it goes without saying that internationalisation has to be regarded as a concern and a shared responsibility for the entire organisation. This means creating conditions for all students (and staff) to obtain intercultural knowledge and skills and international experience. Together with other universities abroad and in Sweden, we are building networks to strengthen cooperation and reap mutual benefits. Let me mention, for example, the South Africa–Sweden University Forum (SASUF), a project focusing on sustainability involving 13 Swedish and 23 South African universities, and MIRAI, a project involving six Swedish universities and several leading Japanese universities. Both initiatives are partly funded by the Swedish Foundation for International Cooperation in Research and Higher Education (STINT). 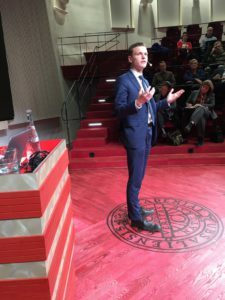 Like many other higher education institutions, Uppsala University has worked hard to raise the profile of Sweden as a study destination, particularly since the introduction of tuition fees for non-European students in 2011. The hard work has paid off: we had 15,800 international applicants for the 2018 autumn semester, compared with 4,225 in 2011. This is important, but the most important thing of all is that we all recognise that international students enrich our activities. The Disciplinary Domain of Science and Technology has set a target of 1,000 paying students by 2025 and, given the present trend, these plans look set to be realised. The Bachelor’s programmes in game design at Campus Gotland are another example, where students from countries other than Sweden are already in the majority. We are now developing a strategy to further strengthen internationalisation efforts on Gotland. Much of our work on internationalisation is going well and we know what is missing. We have drawn up a language policy to ensure that all students and researchers receive instruction and information in the appropriate language and can participate in faculty business and exercise student influence. Quality and Renewal 2017 and our work on the Charter and Code have also revealed the need for improved parallel language use. Many countries have a system or organisation dedicated to coordinating internationalisation efforts in research and education, marketing, trade and innovation, and scientific diplomacy and aid. As the inquiry quite correctly notes, Sweden does not have this type of coordination. No obvious arena exists in which actors/stakeholders from different sectors can combine their efforts or explore synergies in their cooperation with a certain country through joint or mutually complementary actions. To enable universities and other stakeholders to participate effectively in international cooperation (and to increase the impact of their efforts), it is of great importance that the support provided by government agencies is further developed. A lack of coordination risks leading to fragmented internationalisation efforts in which potential synergies between different activities and sectors fail to materialise. One of the measures proposed by the inquiry is a platform for coordination between government agencies. As we pointed out in our consultation response to the inquiry’s interim report, regulations and administrative systems must always support international cooperation, and hopefully this will be a step in the right direction. If internationalisation efforts are to have any real impact, foreign students and staff must not be treated as exceptions and special cases. Since 2015, the Association of Swedish Higher Education Institutions has had an expert group for internationalisation, which I currently chair. The expert group has followed the work of the inquiry closely and we have drawn attention to the need for coordination and the need to remove the obstacles hindering students and researchers from coming to our country. This applies to everything from bank accounts to visa processing by the Swedish Migration Board and housing. If we want Sweden to be an attractive option for international students and researchers, uncertainties and unnecessary obstacles must be removed and a substantial scholarship programme must be established.